from wood products like the Barrelman, oversized rosaries, spoons & forks, to silver jewelry and metal crafts, to ethnic woven cloths, to edible goodies like strawberry preserves, peanut brittle and ube (purple yam) jam. In many Filipino homes here or abroad, one can always spot one item or another that was bought from the Summer Capital of the Philippines. Due to a century of cityhood and a great demand for these items by the visitors who come in droves to our beautiful city, the creation of souvenir items the creative natives have turned the production of souvenir items into both an art and a science. As a member of the hospitality industry and a Baguio resident, I am constantly asked for my recommendations for various products, services and places of interest. As webmaster I get to play the role of "concierge on the web" -- a task I enjoy because I am able explore this beautiful place a little deeper and share all my discoveries with you. The following are my personal favorites. You'll have to try them all out, together with other available brands, in order to prove me wrong. Both ways, Baguio wins! *Please note that neither this site nor I, personally, have received any payment in cash or in kind for these endorsements! • Ube Jams - Tamtanco's (Baguio City Market), if you like it with real ube bits, and Good Sheperd's (Mines View Park) if you prefer it creamy, although the latter is almost double the price of the former. • NEW!!! Best Strawberry Preserves - made by Strawberry House Inc. at 19 Naguilian Road beside the PLDT office. These yummy favorites are not (yet) sold in stores and come in limited quantity. Since the 'factory' is hard to get to, please call 442-7988 for more info. • Choco Flakes - Mikasan Dark Chocolate. This is the darkest and best-tasting. Available in dark and white chocolate combo but I do not like that one as much as the dark chocolate one. It's cheap and simply the best! • Peanut Brittle - If you like it with whole peanuts, classic style, Romana's. If you want finely ground peanuts in 'sheets,' nothing beats Good Shepherd. They have cashew brittle, too. • Lengua de Gato - Rico's and Tartland have the exact recipe but Rico's has better packaging. • Longganisa - The ones that used to be sold at the SVD Seminary, and now available at Paulite's store on Gibraltar Road. They will try to sell you other types of longganisa, so please specify the "SVD variety." • Apple Walnut Cake - Ebai's Cafe at Narda's on Upper Session Road. I prefer the smaller sized whole cake as the frosting is just right, the large one (and those available per slice) is a little too dry for my taste. 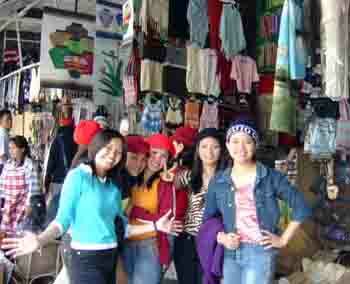 • Best places to go for Ukay-Ukay are in the Ukay-Ukay page. • Best golf course - the one at Camp John Hay. Well, since the city has only two to choose from, this should really be termed, "better" golf course! • NEW!!! Best raisin bread -- and it's not actually what you think -- because there's the more popular one baked by Baguio Country Club but the one the locals love the best is the one baked by Palaganas at Scout Barrio, near the jeepney stop (just ask the people there to direct you to Palaganas bakery). • NEW!!! Best unusual, cultural, educational adventure for boys and girls of all ages is the Balatoc undergound mines tour. We took the tour recently and we loved it! • Best Horse Trail Ride - If it's a short trail you want, Camp John Hay Shalan di Kabadjo ('Way of the Horse') will do, but if you want a really good ride, Santo Tomas Mountain. There's really no point in taking a trail ride to 'Marlboro Country' at Tiptop anymore because you can't ride like the wind across mountaintops these days like we used to in the 1980's. • Recommended Wright Park Pony Boy is Scott -- he has nice running horses, he is easy to spot (looks more like an Indian than a cowboy), and takes very good care of his customers. The teenagers love him! • Best way to buy strawberries to bring home - ask to select each and every piece. Choose the ones that are not yet ripe as they ripen fast on the trip back down. If you get them very red, or choose the ones packed in a basket, they will be overripe when you get home. • Perfect weather month - January (coldest of the cold) usually with no rains, and Baguio is at its most romantic. For information on the best times to come up and visit, please check out Baguio for All Seasons. • Best convention facilities - CAP Convention Center, Camp John Hay. • Best place to buy wooden furniture that's old Filipiniana or ethnic inspired - the stores at the parking area of the Maharlika Livelihood Center. They deliver to places outside of the City of Pines, too! • NEW!!! Best place to find unique ethnic items & artifacts - Rimando's, which is on the Gibraltar side of Mines View Park market. Easy to find it with that beautifully restored Impala parked in front of it. So you've come to unwind, you worked hard and deserve a break, and the cool, fresh air and mountain vistas are just what you need... Welcome to "Relaxing Baguio!" And the list will grow as I discover new things every single day. After more than 35 years of loving Baguio, this beautiful little city in the mist never ceases to amaze me. And I will give you a Baguio City like you've never seen before!